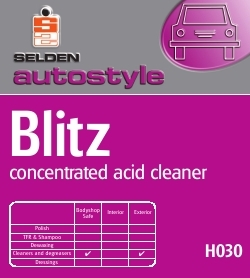 * Ideal for cleaning brake dust and badly stained wheels. * Contains special inhibitors to minimise acid attack on base metals. Dilute up to 4:1 for heavy rust. Apply by brush and rinse thoroughly. For descaling pressure washer boilers, flush through the system at 2:1 dilution. Rinse thoroughly with water. NOTE: THIS IS AN ACIDIC PRODUCT. Do not use on aircraft. Do not use on magnesium alloy wheels or on wheels that have been finished with a decorative anodised effect. If in doubt seek manufacturer's advice. Keep off paintwork and never allow product to dry on. Composition An aqueous blend of hydrochloric acid, nonionic surface active agents, a rust inhibitor and dye.